By: William C. Robertson, Ph.D. Intimidated by inertia? Frightened by forces? Mystified by Newton’s law of motion? You’re not alone—and help is at hand. The stop Faking It! Series is perfect for science teachers, home-schoolers, parents wanting to help with homework—all of you who need a jargon-free way to learn the background for teaching middle school physical science with confidence. 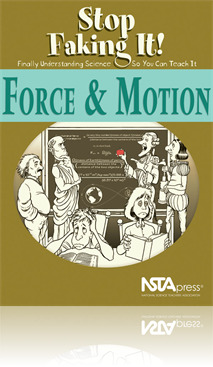 With Bill Roberton as your friendly, able—but somewhat irreverent—guide, you will discover you CAN come to grips with the basics of force and motion. Combining easy-to-understand explanations with activities using commonly found equipment, this book will lead you through Newton’s laws to the physics of space travel. The book is as entertaining as it is informative. Best of all, the author understands the needs of adults who want concrete examples, hands-on activities, clear language, diagrams—and yes, a certain amount of empathy.